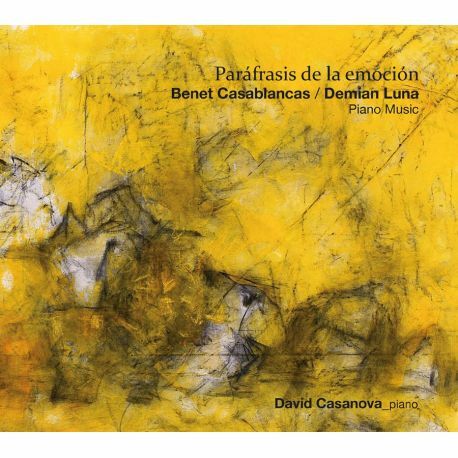 After a concert by David Casanova at the French Institute of Barcelona, where he played, among others, the Impromptu by Benet Casablancas and Memorias del Abismo IIb, by Demian Luna. At first, both the pianist and the composers decided to select the works with a clearly ambitious mind, while collecting as many works as possible to design a rich and varied record. In the case of Demian Luna, his piano collection consists of four works in a period going from 2004, with the appearance of Tres reflexiones, until 2017 with Memorias del Abismo V. Between this long period of 13 years we find the appearance of two more works: the Dos interludios and Memorias del Abismo IIb, that complete his piano solo pieces. In the case of Benet Casablancas, we had to start from the first Haikus for piano, from 2007, opening a period of pianistic production that reaches until 2017. In this period, the composer has never stopped writing for this instrument, and has drastically enlarged his current piano repertoire by bringing in works of great relevance. Previously to those years, the composer had already written pivotal moments for piano, such as the Seven epigrams, from 2003, or the very powerful Tres bagatel•les, also written that year.